Hybrid materials made of carbon nanotubes and semiconductor metal oxides for gas sensing applications. Low dimensional nanostructures (nanoparticle and nanowires) of metal oxides for gas sensing applications. Synthesis, characterizations, and applications of GRAPHENE. Nanofibres via electrospinning for nanosensors, nanocatalysis, filtration, and protective clothing. 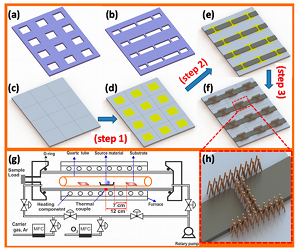 Scalable fabrication of high-performance NO2 gas sensors based on tungsten oxide nanowires by on-chip growth and RuO2-functionalization. Abstract: The synthesis of cost-effective, high-performance hydrogen gas sensors is eliciting increasing interest because of their advantages in early detection of hydrogen leakages. Herein, we report the in- situ synthesis and decoration of Pd nanocrystals (NCs) on the surface of mesoporous NiO nanosheets for effective hydrogen gas sensor application. The use of large specific surface area of the mesoporous NiO nanosheets and the catalytic activity of the Pd NCs are the key points to improve the hydrogen gas sensing performances through the enhancement of the interaction between the hydrogen molecule and the sensing surface. The mesoporous NiO nanosheets were fabricated by a surfactant-less hydrothermal method in sequence to thermal oxidation, whereas the Pd NCs were decorated by in-situ reduction of palladium complex. The crystal structure and growth mechanism of the materials were investigated by several advanced techniques. 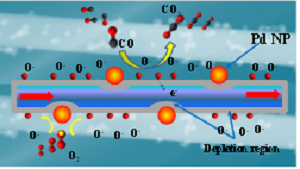 The gas-sensing measurements revealed that the Pd-NiO nanosheets based sensor exhibited effectively detection of hydrogen at low concentration with fast response, high sensitivity and stability.